Our Chinese exchange student does not seem to be very much of a recipe gal. Here is how I captured this one…. We bought nearly 3 pounds of skirt steak. She considers other beef, but she believed something with more fat would be best. She froze the meat for 3 hours or so. Once it was semi-frozen, it became much easier to slice the meat very thin. And, I did every slice. The meat was put into a bowl where she added water. The goal was to unfreeze the pieces of meat that were still frozen. She got all of the water out, and put in a big bowl. She added corn starch, (not sure why she does this) salt, and pepper. She hand tossed all of the meat slices together and let them sit for a while. She washed the whole cabbage. She then peeled off every individual leaf…placing each one carefully in the large pan. When all leaves were removed and the pan was full, she filled the pan up with water until nearly to the top. She then put the pan on to boil. After turning the cabbage within the pan a few times, the cabbage was all tender. She pulled out the cabbage one piece at a time. The cabbage was cut into 4 or 5 inch pieces and put into another pan/bowl. The Chinese noodles (or rice noodles) were added to the cabbage water and boiled until done. We cooked on the wok. Peanut oil was put in the bottom of the wok. The chopped ginger and hot peppers went into the oil. A couple large dollup of the red bean paste along with a good dollup of Chinese bottled red pepper paste were added. Once the flavor was drawn out of the ingredients, 6-8 cups of water were added. 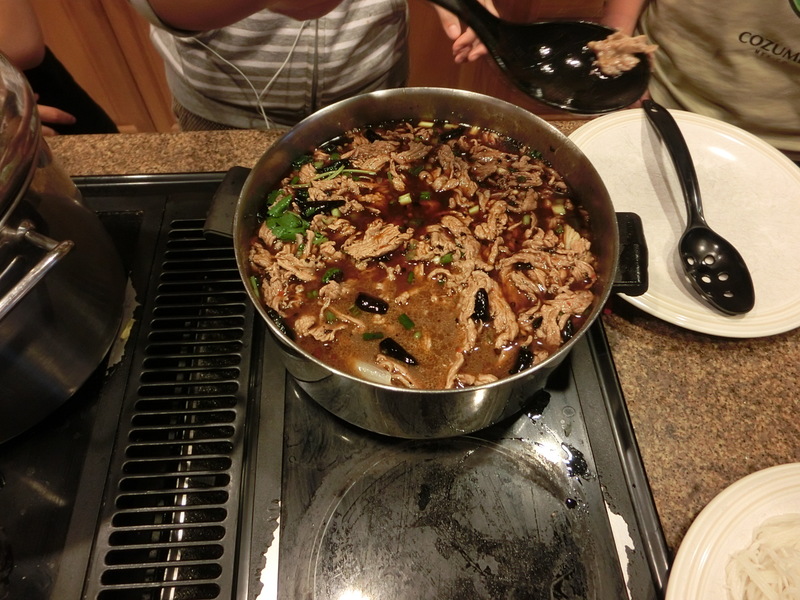 Soy sauce and a bit of the oyster sauce were also added. Once the water/oil mixture was heated, the meat pieces were all added. They were NOT dumped in. The meat pieces were added slowly with each piece being separated. If the broth was not the right flavor, salt and/or pepper could be added here. Also, soy sauce could be added here. When the meat was cooked, the broth was poured over the cabbage pieces that were now resided in a different pan–the entire contents of the wok was put over the cabbage. The remaining fresh veggies (cilantro and garlic) were put into the pan with the cabbage and meat. A bit of additional peanut oil was heated in the wok. Once heated, it was poured over the soup. The total amount was probably a quarter cup or so. Since our peppers were not hot enough, the hot oil was poured over the additional hot pepper powder that was added to the soup. We placed some of the noodles in the bottom of a bowl. We simply dipped some soup over it–trying to get a balance of broth, meat, and cabbage. VERY good and enjoyed by all…even our TOUGHEST critic. Slightly hot (not because it was soup), but thoroughly flavorful and tasty!